Happy Wednesday! today we’re on a street just outside Akihabara where I came across one of the stranger sights of my first Tokyo trip. 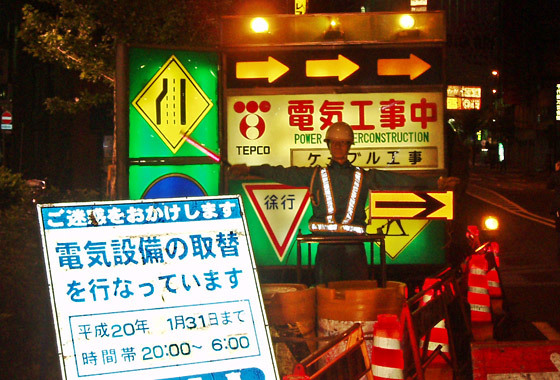 Yes that is indeed a mannequin flanked by multiple signs, dressed in a road worker uniform, with his own hard hat and lightsaber baton thingy. Oh and his arm was motorised too! Spotted this bizzare creation on my way back to my hotel in Ochanomizu from Akihabara in 2007 and assumed it must’ve been there for weeks, until I realised id walked past earlier that day. The sign suggested they’d be gone by 6am which being from the UK where 2 weeks of roadworks means 6 months I took that with a pinch of salt. Low and behold though, come 6am the works were done, my mannequin friend was gone and traffic was flowing. Impressive, most impressive. From the big sign: “Power underconstruction” … Meaning it was underconstructed? 😀 I love Engrish some days. Hehe it’s always good for a giggle! There’s a shop in Harajuku called ‘Store My Ducks’ – random or what!